Parts: 40 injection molded BS plastic . Since the movie "Galaxy Quest" was released, folks have been waiting for models. The ship is listed as being 1:1400 scale. A single sheet of decals is included, featuring markings for one ship only, the Protector (NTE-3120). The instruction sheet is fairly simple, with nine steps to complete the building. One nice addition is a two-page section with paint color and decal location call-outs. The kit has 41 parts and appears to be cleanly molded with ejector marks or flash. There is a lot of detail in the form of finely engraved panel lines. The parts are molded in light gray ABS plastic for the major components. There is also a sprue of clear blue parts for the engine gratings. 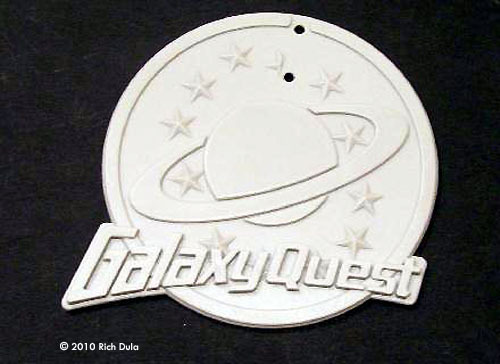 A very nice Galaxy Quest logo base is included in the box. The Command Ship, which the crew crashes in the ending sections of the movie, is removable from the remainder of the ship. 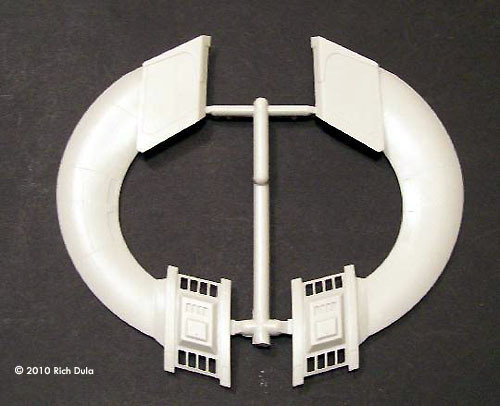 Pegasus has included four magnets to hold the Command Ship in place, but the instructions do not indicated where the magnets are supposed to be installed. 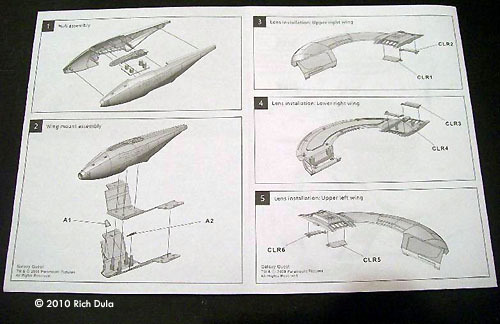 It appears that they would become part of the model in Step 1 when the hull is assembled (recessed plate that goes on the top of the hull), and in Step 9 when the Command Ship is built (the bottom section of the two-part Command Ship). It also looks like there are ways to light the kit if desired. The most-difficult part appears to be running wire up through the pylons and into the engine sections. The two-part pylon assembly (upper and lower halves) are fairly thin, and there might not be a lot of wiggle room available to run the wires. There really isn't an interior framework on these parts, so very thin wire would be needed to reach the bulbs in the engines. Lighting the Command Ship might also be difficult unless you decide to permanently attach it to the rest of the hull. One confusing thing is that Pegasus didn't include part numbers for the major components. Part numbers are only provided for the clear blue parts and for some of the smaller parts. There aren't any locator numbers on the sprues or on the parts themselves. I'm looking forward to building this kit, and I'm glad that one has finally come out. 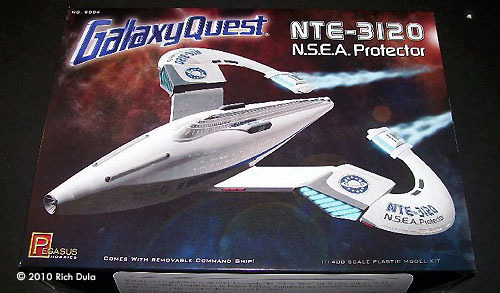 If you're a Galaxy Quest fan, you better get this kit before it's gone. And remember . . . . Never give up, never surrender! Many thanks to Rich's wallet for providing the review sample. Manufacturers and retailers, interested in getting your wares reviewed and publicized on a site averaging 6000+ readers a day? Contact us! This page copyright © 2010 Starship Modeler. First posted on 10 February 2010.